we wrapped up one show this weekend and moved right onto the next show on monday. to celebrate surviving another successful show, we made waffles for breakfast. why not? we are huge fans of both peanut butter and chocolate, and we love the two combined. 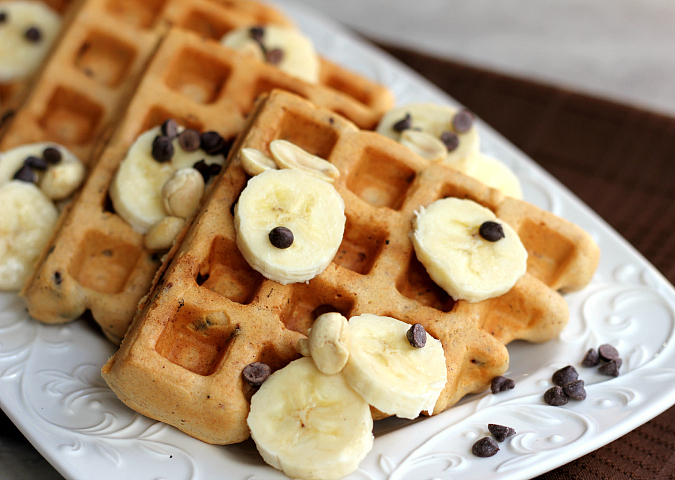 so, peanut butter and chocolate in a waffles? yes, please! 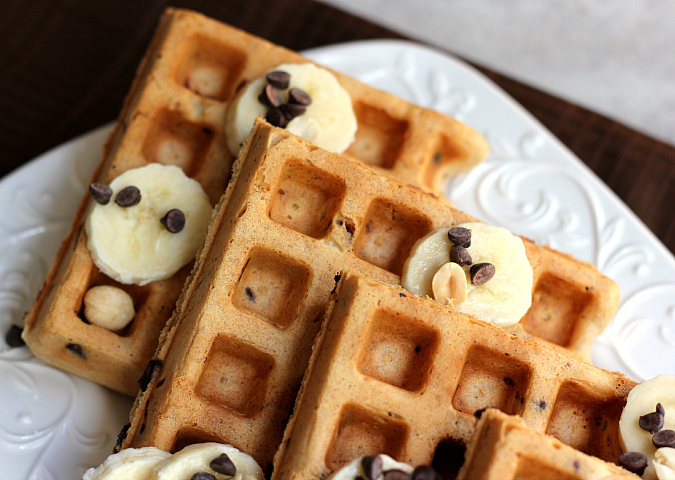 the peanut butter gives these waffles an awesome flavor, and the mini chocolate chips make them extra special. surprisingly, they are not sweet at all. 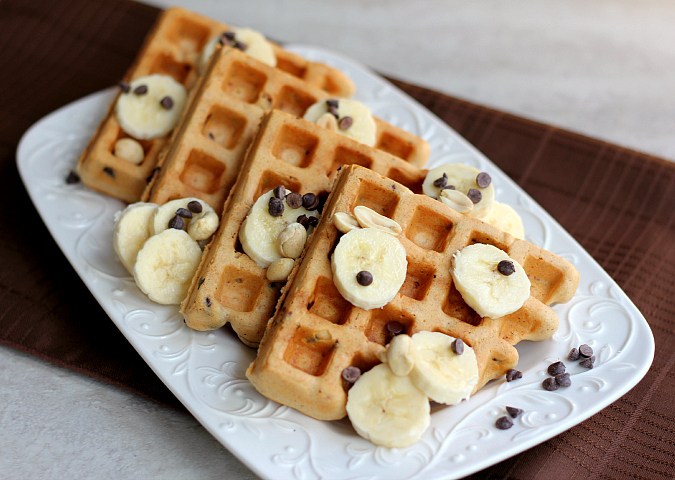 we topped our waffles with slices of banana, roasted peanuts, mini chocolate chips, and warm maple syrup. they certainly were a wonderful treat! preheat your waffle iron according to the manufacturer's instructions. in a large bowl, combine the flours, baking powder, sugar, peanut butter, eggs, and milk. whisk well until combined. stir in the melted butter. fold in the chocolate chips. pour enough batter into the waffle iron to just barely cover the waffle grid (usually about 1/2 cup of batter per waffle). cook 4-5 minutes, or until the waffles are golden brown. once cooked, transfer the waffles to a cooling rack while you prepare the remaining waffles. 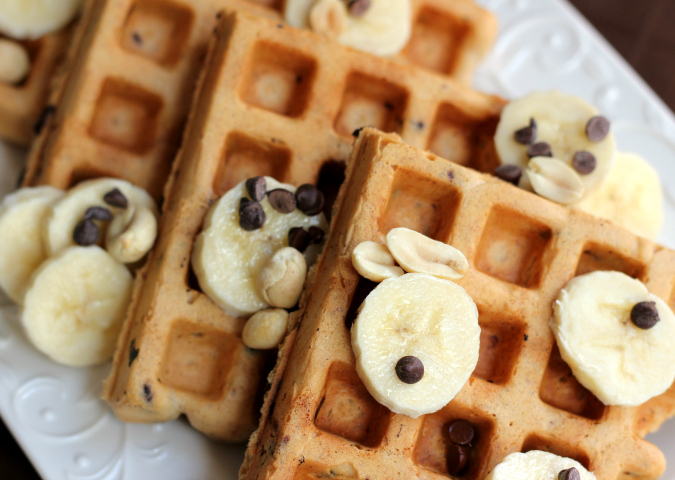 serve warm, topped with sliced bananas, peanuts, mini chocolate chips, and warm maple syrup. That looks yummy. Peanut butter and banana is a good combination. Definitely need to make these this weekend! These look scrumptious! And almost too pretty to eat! These look amazing! I love how for such a sweet treat, the ingredients are more on the natural side of things. Like the whole wheat flour, natural peanut butter, and the almond milk. I'm definitely gonna have to give these a try. Thanks for sharing!